ManyTutors: Elite Creations (West Coast) Reviews. Book Online! Elite Creations Education Centre was started with the intention to help students from the heartland to develop strong interest in education and to nurture students to be curious learners. 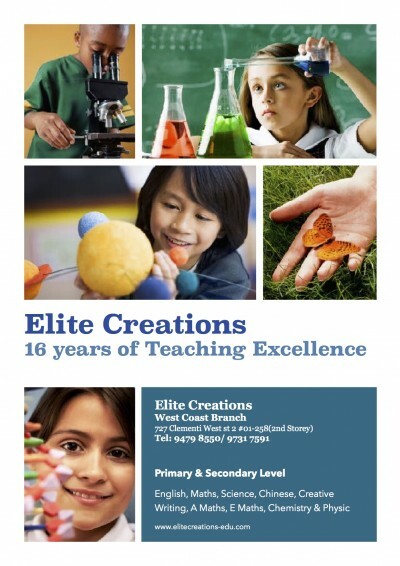 At Elite Creations Education Centre, we understand that each and every student is special and unique. We believe that all students have the ability to excel in their studies and our classes are carefully designed to suit every student's learning abilities. We believe that with our patience and understanding, together with our innovative and interesting approaches to teaching, students will enjoy and appreciate what they learn and eventually develop the passion for learning.